Abigail Kemp needs a man's name on her bakery's deed or she'll lose her business. A marriage of convenience seems sensible, but with her independent spirit, she wants somebody she can control. That certainly doesn't describe Zacharias Hamilton. But in many ways, he's the best man for the job---and maybe for Abigail, too! 368 pages, softcover from Bethany. After fulfilling a pledge to a dying friend, Zacharias Hamilton is finally free. No family entanglements. No disappointing those around him. Just the quiet bachelor existence he's always craved. Until fate snatches his freedom away when the baker of his favorite breakfast bun is railroaded by the city council. Despite not wanting to get involved, he can't turn a blind eye to her predicament . . . or her adorable dimples. 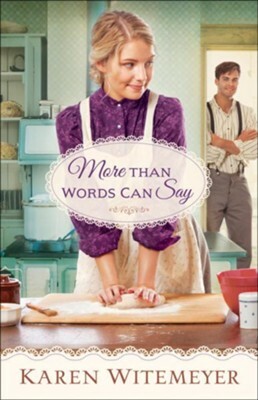 Abigail Kemp needs a man's name on her bakery's deed. A marriage of convenience seems the best solution . . . if it involves a man she can control. That person definitely isn't the stoic lumberman who oozes silent confidence whenever he enters her shop. Control Zacharias Hamilton? She can't even control her pulse when she's around him. When vows are spoken, Abigail's troubles should be over. Yet threats to the bakery worsen, and darker dangers hound her sister. Can she put ever more trust in Zach without losing her dreams of independence? Winner of the HOLT Medallion and the Carol Award and a finalist for the RITA and Christy Award, bestselling author Karen Witemeyer writes historical romance to give the world more happily-ever-afters. Karen makes her home in Abilene, Texas, with her husband and three children. Learn more about Karen and her books at www.karenwitemeyer.com. I'm the author/artist and I want to review More Than Words Can Say.